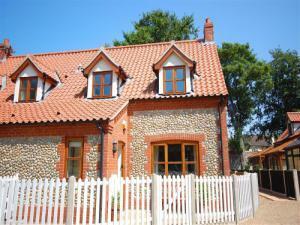 4 Garden Cottages01263 715779work01603 870304fax Self-cateringThis modern flint and brick property in the charming village of Blakeney is only a short walk from the quay. Offering wide rooms and contemporary outfittings, this cottage provides a luxurious stay. Boat trips are available to go and observe the natural wildlife of Blakeney point, which includes seals and migratory birds.